Every diesel vehicle over 10 years old is now effectively banned from operating in any part of the entire city area of Stuttgart, home to Porsche, Mercedes-Benz, and 630,000 residents. The move signals the first serious diesel ban in any German city. A mid-year review of the resulting pollution rates will decide if many of the remaining diesels, older than 5 years, will also be banned from 2020. This week, following a 3 month phase-in period, Stuttgart has fully implemented its complete ban on 10-year-old diesels (Euro 4 standard) and older, both from entering the city and from being kept within it. As of April 1st, even such diesels owned by city residents themselves are now banned. There are a few modest exemptions for delivery, service, and emergency vehicles, and for folks with medical needs. 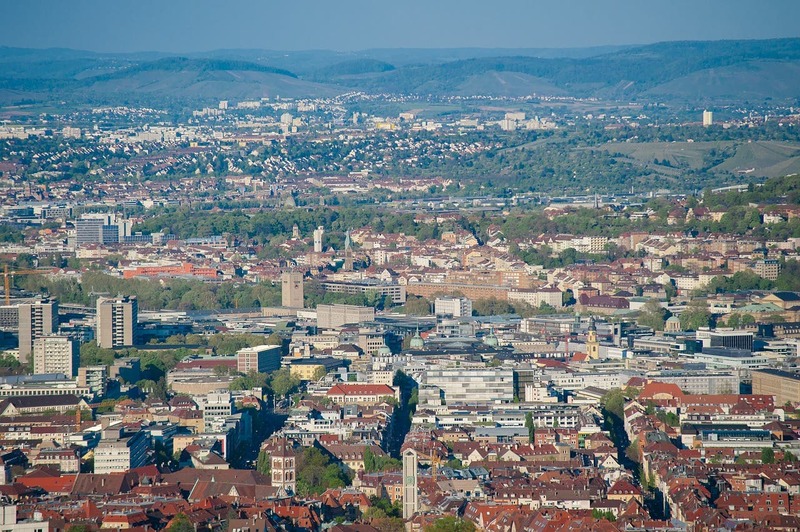 The regional Baden-Württemberg government has been forced by environmental activists to implement the Stuttgart ban, to meet its EU legal obligation to reduce NOx pollution to permitted levels. This follows recent regional and federal court cases brought by the activist group DUH (Deutsche Umwelthilfe) in Stuttgart as well as other German cities, following the failure of federal government and the auto industry to adequately tackle the pollution problem. The European environment commissioner, Karmenu Vella, has also been applying political pressure to Germany (and other nations) to take action on excessive emissions. Stuttgart is not the first German city to implement a diesel ban. That honour nominally goes to Hamburg, which last year implemented a weak and largely symbolic (and poorly enforced) ban on just two city streets. The Stuttgart ban is much more wide-ranging, as just noted, banning driving and even parking of older diesels in the entire city area, home to 630,000 residents (Germany’s 6th largest city). 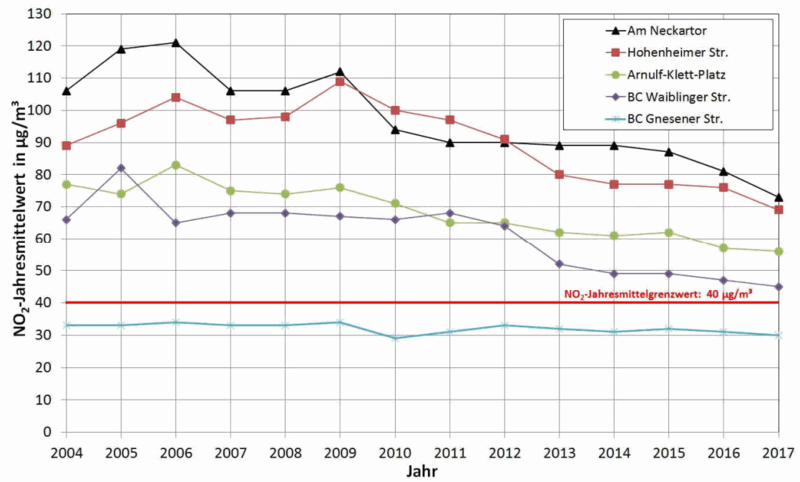 Although the even more deadly particulate pollution is mostly down from peak levels of the past decade, average NOx levels in city centre areas are still the highest in Germany, well above legally permitted levels. Germany’s Federal Environmental Agency estimates that NOx pollution in urban areas, mainly from diesel vehicles, causes the early death of around 6,000 people a year in the country. The worst hotspot is recorded by the monitoring station at Stuttgart Am Neckartor, which still averages above 70 µg/m3, where the EU legal average annual limit is 40 µg/m3. Shockingly, this is within a minute’s walk of the city centre’s largest park and lake, Mittlerer Schlossgarten, a favourite of families. The ban can be traced back to the emissions diesel cheating scandal (sometimes called “dieselgate”), both the specific scandal around Volkswagen and the wider culture of OEM emissions cheating that has gone on for years. If the Euro emissions standards were actually adhered to in practice, rather than bypassed through cheating on official tests, NOx emissions would not now be over the legal limits in Stuttgart, or any other European cities. The ugly nexus of corruption between automakers, complicit testing agencies, and turn-a-blind-eye national governments instead gave us dieselgate. The only silver lining was the reaction — in the form of much toughened standards — that the scandal caused. 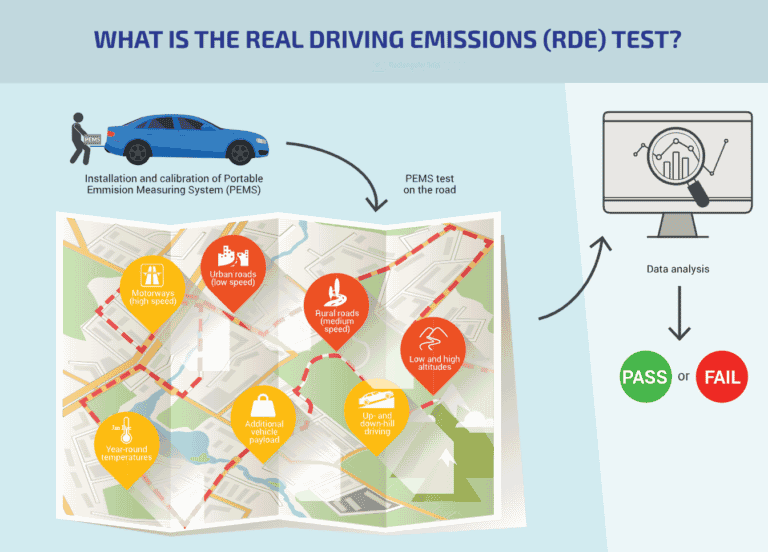 The new WLTP standards, especially combined with RDE (real driving emissions) tests, are forcing automakers to improve. The latest RDE-compliant Euro-6 TEMP diesels (coming on the market from late 2018 onwards) employ — and don’t turn off — expensive technology designed to meet the legislated limits for both NOx and particulates. This is just as well, since Germans are still buying new diesels at a steady rate, with March 2019 diesel market share of 32.4%, according to the KBA. This market share has been fairly static over the past year or so. Having combustion engines inside, the Euro-6 TEMP–compliant vehicles of course still pollute. 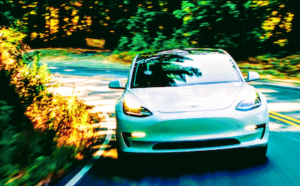 The Euro-6 TEMP standard still includes some wiggle room (officially called “conformity factor”) to help OEMs adapt to the “harsh reality” of the new RDE tests, but this is quickly tightening in newer standards coming over the next couple of years. Whatever the technological improvements over previous diesel generations, carbon emissions are still an inevitable result of fossil fuel combustion. 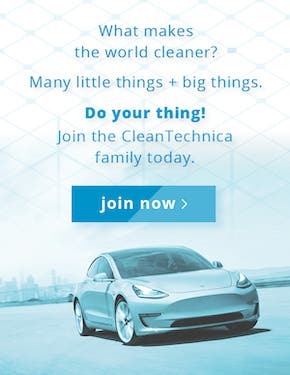 Meanwhile, electric vehicles emit zero pollution of any kind. Of the 200,000 diesels registered within Stuttgart at the end of February, around 18,500 of them were Euro-4 (roughly, that means up to 2009) or older, thus not making the grade to stay in the city. 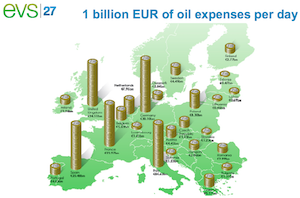 Of the remainder of the diesel fleet, there’s, presumably, approximately a 50:50 divide of Euro-5 vehicles (up to 2014) and more recent Euro-6 vehicles (from 2014 to present). If the current ban of Euro-4 (and older) vehicles brings the worst-offending NOx hot spots down below the 40 µg/m3 limit, the newer diesels on the road today will be spared. The regional government will undertake a review in the middle of this year to check the pollution progress. If still more needs to be done to reduce NOx, Euro-5 diesels may face a ban from January 2020. 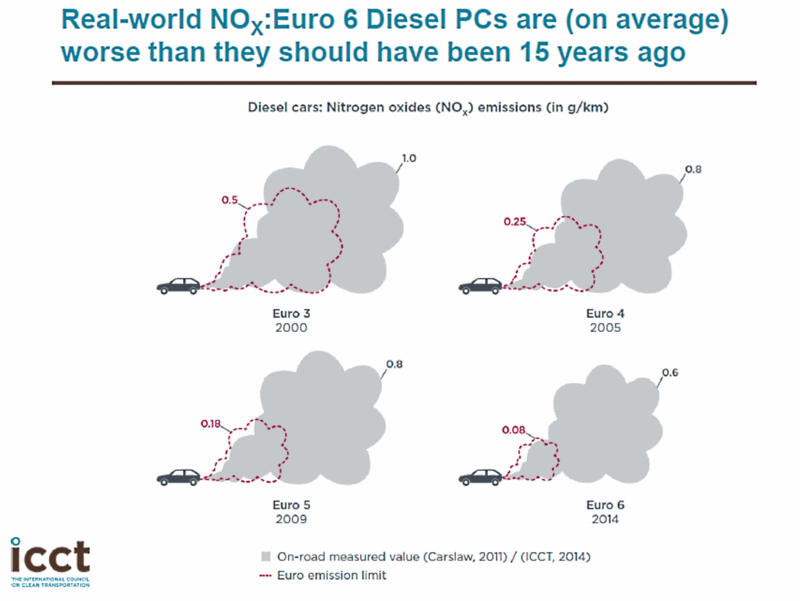 Judging by the above ICCT “Real World NOx” infographic, it seems quite possible that Euro-5 will also need to be banned, since they are just as polluting as Euro-4, and make up a much larger portion of Stuttgart’s diesel fleet. 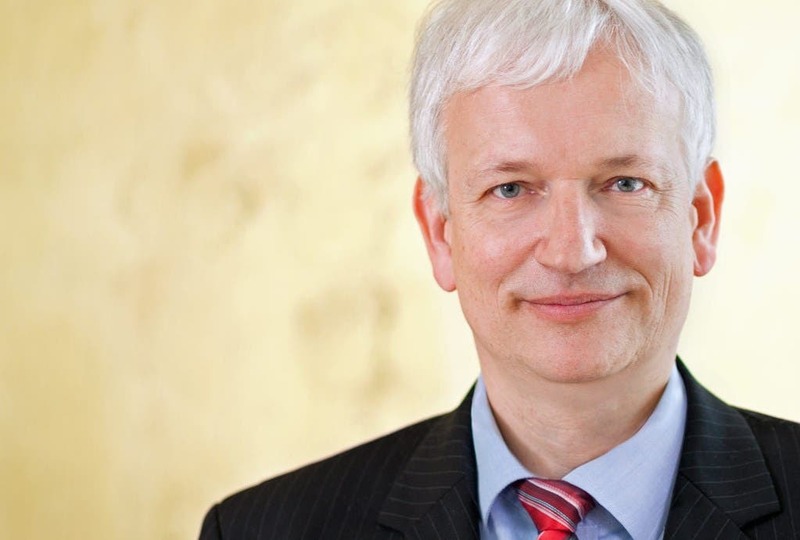 Andreas Schwarz, who heads up the Green Party group in the Baden-Württemberg regional assembly has said, “We want to avoid bans on Euro 5 diesels by implementing a comprehensive package of clean air measures.” These include expanding public transport and the use of EVs. Let’s see how that plays out in practice. For those wondering, the current ban is enforced via the established practice of vehicles displaying environmental-standard stickers (corresponding to their Euro-standard) in their front window. 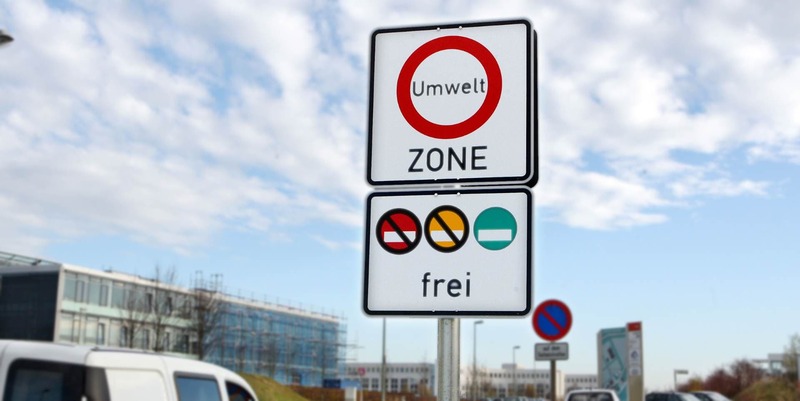 Many Germans cities have had modest low-emission zones (Umwelt Zone) since 2008, clearly indicated by road signs at their borders, but have typically only excluded the 1 or 2 percent worst-polluting vehicles. Vehicles moving around within the zone have their sticker checked “on the fly” by traffic police, and other city police check parked vehicles as part of their daily duties. Fines are levied for non-compliance. This existing window-sticker-checking framework is simply being amped up for the Stuttgart diesel ban. The new fine for non-compliance now amounts to just shy of €200 (around $250) via a fixed penalty plus legal costs. There was initially some temporary pushback against the ban in Stuttgart from a local “yellow vest” movement in the first months of 2019. This was organised by none other than a young ex-Porsche worker, Ioannis Sakkaros. He himself admits that, since the ban has now come into practice, the wind (hot, polluted air?) has gone out of the protest movement. There is also a small local effort to mount a legal challenge. Given the landmark ruling by the federal court in Leipzig in February 2018 — upholding the legality-in-principle of city diesel bans — a local legal challenge would appear to have little chance of succeeding. Domino Effect in Other Cities? 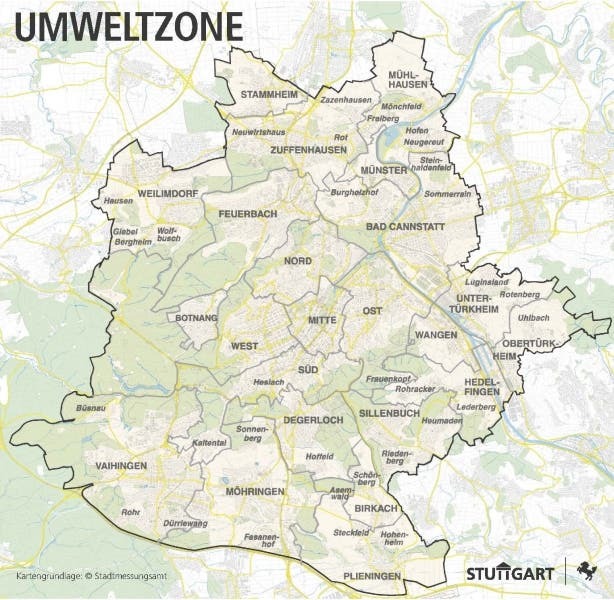 As mentioned earlier, the Stuttgart ban has largely come about as a result of a long and wide-reaching campaign by the group Deutsche Umwelthilfe (DUH, also known by their English name Environmental Action Germany). As of mid-2018, 28 cities across the country were being sued by DUH for illegal levels of pollution, mainly focused on NOx levels that exceed the legal limit of 40 µg/m3. Stuttgart is well known as “the German capital of air pollution,” and DUH has been pushing hard for change in the city. In January 2016, when particulate levels in Stuttgart spiked to 2× the EU legal limits, authorities issued the first ever “air pollution alert.” Their lacklustre solution at the time was to request voluntary abstinence from driving, and more use of public transport. No improvement resulted. One positive side effect was the possibility of a future ban being voiced by the Mayor, Fritz Kuhn (Green Party). Back then, DUH’s chairman, Jürgen Resch, put the essence of the problem down to German authorities being too quick to dismiss the option of bans because “they are scared of the car industry.” In fact, DUH has since gone so far as to suggest that Angela Merkel is “remotely controlled” by the German auto industry. The industry (hand in hand — or remote in hand — with the federal government) has been dragging its feet for years over what action to take regarding the excessive emissions of the existing diesel fleet. Following an August 2017 government+industry meeting, a software modification was agreed by both parties to be sufficient, and started to be implemented for much of the fleet. Critics countered that this “mickey mouse political solution” only resulted in 5% emissions reductions, at best. Another closed-door meeting, in early October 2018, resulted in a more ambitious agreement from the industry to fund trade-in schemes above market value for older diesels (to newer, less dirty vehicles), and/or fund some hardware retrofits to existing vehicles to improve emissions. But these measures were only agreed to be offered for diesel owners in the 14 most polluted German cities. 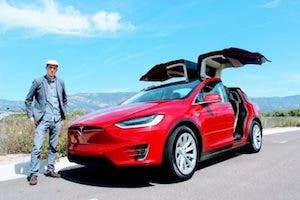 VW and Mercedes have since taken steps to implement these schemes, but BMW has so far refused to take part (based on its claim of being not-as-dirty-as-the-others). Ferdinand Karl Piëch, former chairman of the executive board of Volkswagen Group (1993–2002) and chairman of the supervisory board of Volkswagen Group (2002–2015), with Volkswagen branding in the background. None of this foot-dragging and “mickey mouse politics” has been met with much applause from environmental and social justice campaigners. The Stuttgart ban is obviously a more concrete solution to pollution problems. Alongside their legal action in Stuttgart, DUH campaigners have carried out similar legal actions in many other German cities. Munich officials lost a court ruling in 2017, but have so far refused to act. A similar ruling was made against Berlin in late 2018, with a partial diesel ban ordered by 2020, but city officials have responded that it will be hard to implement in that timeframe. Around the same time, Frankfurt was also ordered to implement a diesel ban, but has not yet taken any action. Similar court orders have been imposed on Mainz, Cologne, Düsseldorf, and Bonn, all at the hands of DUH. All these cities have either appealed the respective court orders, have not yet taken any action, or are trying to implement other remedial actions to reduce pollution, in the hope of avoiding outright bans. The successful implementation of the ban in Stuttgart — and its effect on air pollution levels — will put significant pressure on officials in all the other 28 cities that seek to ignore or obfuscate against such court rulings. 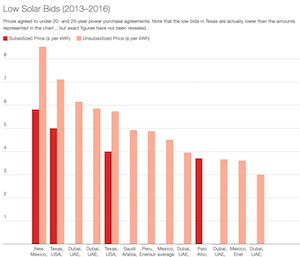 It may also have a domino effect in other German cities, and from there, elsewhere in Europe. Instant Karma for Porsche and Mercedes? In what seems like appropriate related news, German auto sales figures for March saw an overall drop (of a modest 0.5%) year over year. Leading the fall were Porsche (-9.5%) and Mercedes (-5.2%). 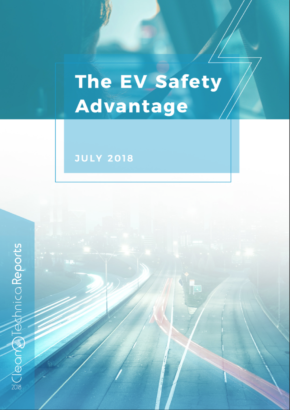 Meanwhile, EVs grew 74.5% year over year, with an overall market share of 1.9%. 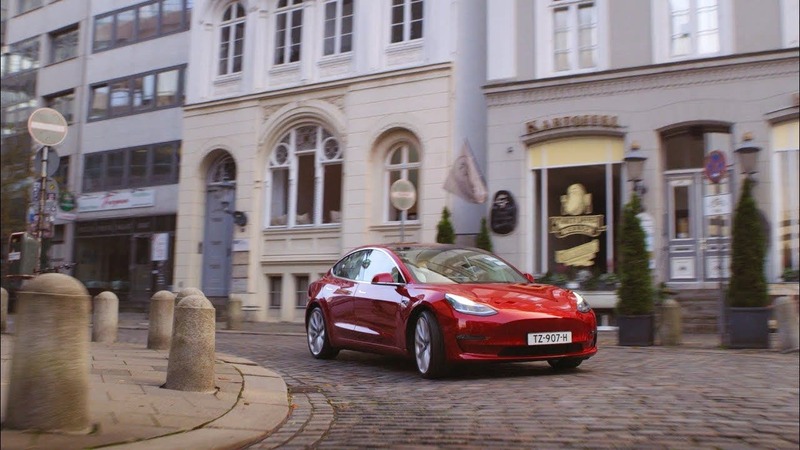 Leading the way was Tesla, whose Germany sales increased 453% over March 2018. Are you a resident in Stuttgart or one of the other German cities facing a diesel ban? Please share your thoughts and experiences in the comments.